Community Solar NY makes solar installation more affordable and feasible. Long Island, NY - December 7, 2014 - Governor Andrew M. Cuomo today announced the launch of Community Solar NY, a new effort under the NY-Sun initiative to make implementing solar easier and more affordable for communities across the state. The program launched today supports community projects known as “Solarize” campaigns – locally-organized community outreach efforts aimed at getting a critical mass of area homes and businesses to install solar. Applications and additional information on Community Solar NY are available on the NYSERDA website. Ellen Honigstock, Founder, Sustainable Kensington Windsor Terrace, said, "The original goal of Solarize Brooklyn was to normalize renewable energy in our borough. We were amazed at the level of interest we saw among our neighbors and so pleased that the program effectively doubled the number of solar energy projects in our neighborhoods. We are eagerly awaiting the continued growth of clean energy in New York City from Solar One's new community initiative, Here Comes Solar, which traces its inspiration and origins directly to the experience, success and impact of Solarize Brooklyn last year." 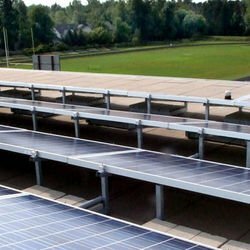 Subject: LongIsland.com - Your Name sent you Article details of "Governor Cuomo Launches New Effort to Boost Solar Implementation in Communities Across New York State"